As you know, the 14th Street Y has come through the hurricane intact but is currently without power. Until further notice, the building will remain closed. We’ve been working to find resources for you over the next few days until power and subway service is restored. Our friends have generously offered their locker rooms and showers for 14th Street Y Members. Hours: Today through Saturday. 5:30am-2pm & 7pm-closing. Please bring your own towel, and show your 14th Street Y membership card to security. Solar One is using their solar generator to create a way for people to charge their cell phones. If you’re still without power, they are waiting for you to stop by. We are also tweeting and FB’ing ways for people to find comfort and support in the neighborhood. Our team is thinking about all of the people in distress in our community and beyond it, and we are preparing to reopen as soon as possible when it is safe to do so. Unfortunately, we still do not know when this will be. We will do our best as a community center to be there for you, and we will try to meet the challenges together, one step at a time. We invite you to continue to check our website for information about plans for reopening the Y as it becomes available. Please take care of each other, and stay safe. 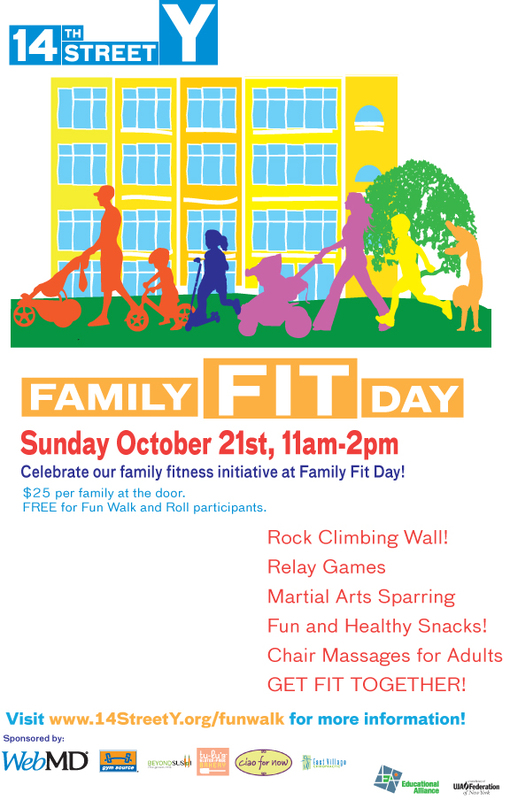 FAMILY FIT DAY This Sunday October 21st! Why? Because Families are busy, but still want to spend time together, build great habits, and model a healthy lifestyle for their kids. We’re celebrating our Family Fitness Initaitives with FAMILY FIT DAY at the 14th Street Y. Climb a rock wall, play silly sports, run fun relays (gunny sack races, anyone?) and play super soccer stars TOGETHER. Sponsored by Beyond Sushi (YUM! ), East Village Body Works (chair massage for adults!) Tu-Lu’s Bakery (also, YUM!) Gym Source, Web MD (thanks!) and our friends at the wonderful Ciao for Now. 11:00AM-2:00PM. Hope to see you there! Our first Family Fitness Intensive was as fun as it looks! Don’t be sad if you missed it. Our next Family Fitness Intensive will be Sunday, November 4th at 12:30PM, Family TRACK DAY! 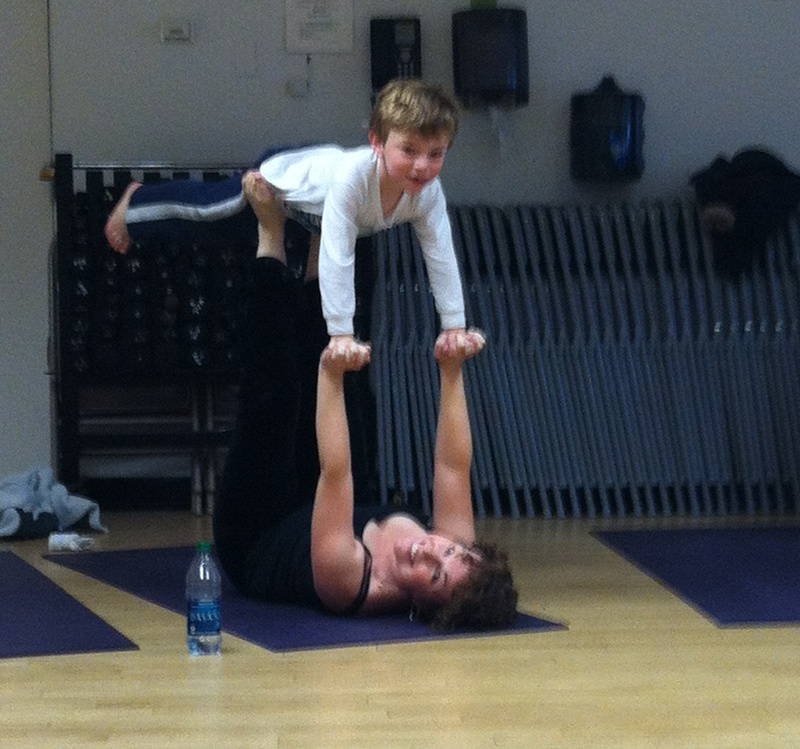 We’re so happy that so many people came to stretch, strengthen, breathe and bond at Family Yoga! Also, don’t forget that we’re celebrating Family Fitness on FAMILY FIT DAY, Sunday October 21st, 11:00-2:00PM. FAMILY FIT DAY will give us more opportunities to play together, with rock wall climbing, relay games, fun and healthy food and even chair massages for adults! We can’t wait to see you. Family Fitness at the 14th Street Y! Family Fitness is more important now than ever before. Like it or not, our kids are on track to be the first generation to have shorter, less healthy lives than their parents. For this reason, the 14th Street Y is making Family Fitness a priority! Because we understand that families are busy, we know that combining exercise with fun and being together is the best way to ensure a healthy amount of activity. With your membership you and your kids can enjoy Family Swim 7 days a week, Family basketball court time every Saturday, plus Special fitness intensives for the family the 2nd Sunday of every month. 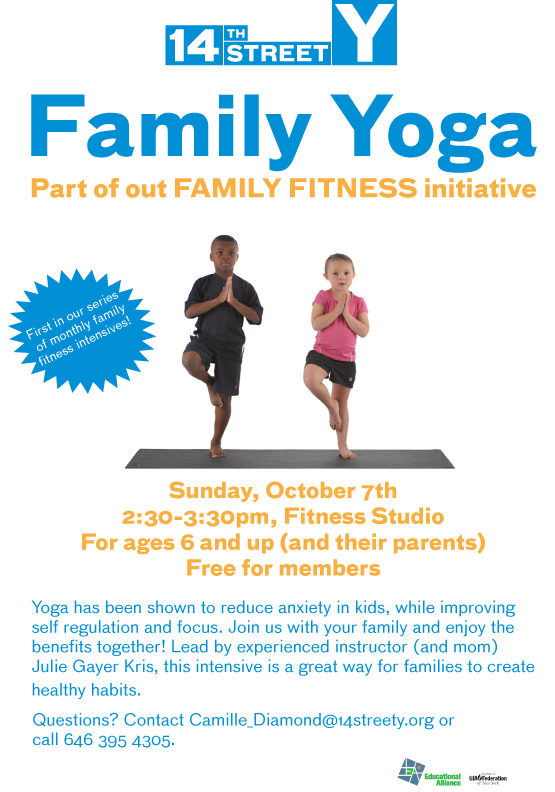 Join us for our first Family Fitness intensive THIS SUNDAY! Our goal is to not just create opportunities for families to be FIT TOGETHER, but to create memories for healthy habits to last a lifetime. Save the date for our FAMILY FIT DAY event on Sunday, October 21st! Rock Wall Climbing, great food from Beyond Sushi and Tu-Lu Bakery, plus fun relay and fitness games that you and your kids can do together! Check www.14StreetY.org/funwalk for more details!